For me, the two most fun areas in which to shop or socialise in Brighton today are without doubt North Laine and the Lanes. For those who call them the North & South Lanes (Mike – that’s you! ), I’d like to clear up the distinction between the two quite different areas once and for all. The Old Town of Brighton is the area surrounded by West Street, North Street, East Street and the sea. It is thought that it was developed from the thirteenth century after the fishermen settled above the cliffs. Although the whole town was burnt by the French in 1514, much of the original street layout survived. The heart of the Old Town is known as the Lanes and contains some of Brighton’s oldest and most interesting buildings. Before the early 1800s, the farming land surrounding the Old Town was divided into five ‘laines’ confusingly. Each laine, meaning ‘loan’ or ‘lease’, was an arable field let in small portions to tenant husbandmen by its freeholders. Each laine, not lane, was divided into furlongs which were then divided into paul-pieces. These divisions were to play a great role in the layout of the town later as landowners invariably developed their land in these discrete sections. The five laines were called West Laine, East Laine, Hilly Laine, Little Laine and North Laine. North Laine was developed from the 1820s and is today considered to be the area surrounded by North Street, Queens Road and Old Steine, though it’s boundary to the north is debatable as much of it (think about the area behind the west side of London Road) has been lost to ugly 1960s and 70s rubbish. The fantastic new Jubilee Library, with its gleaming black mathematical tiles, now forms the new cultural hub of North Laine. Great architecture! 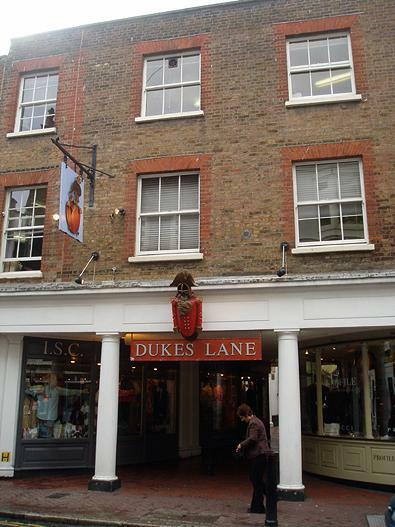 Also, Dukes Lane, between Ship Street and Middle Street is exactly the sort of scheme that I would to see more of. You’d never be able to tell that it was built in 1979 at a cost of £1.25 million – it blends into its surroundings perfectly. Both the Lanes and North Laine are home to many of Brighton’s antique shops, pubs, restaurants and art shops. 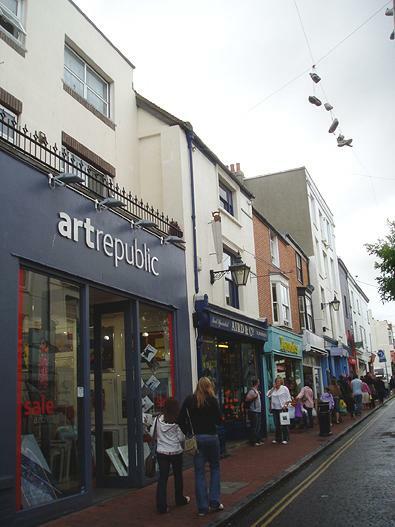 The independent retailers in these two areas make Brighton unique though many struggle against bigger chain stores. For me, the identical shop-fronts of the chains are a blot on Brighton’s individuality. Support our local traders!